KT Corp. (KRX: 030200; NYSE: KT), South Korea’s largest telecommunications company, is running a special promotion for foreign visitors who purchase its SIM-card and WiFi services through the end of the year. 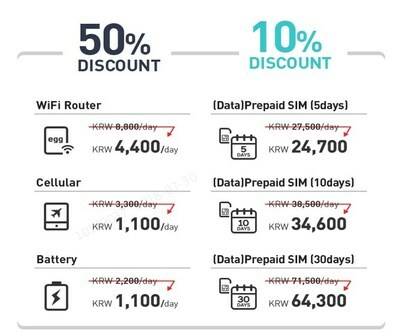 For a limited time, foreign travelers can receive a discount of up to 50 percent on KT’s mobile roaming services when pre-ordering online from the company’s English website (http://roaming.kt.com/rental/eng/main.asp). For phone inquiries, visitors can call the KT Roaming Center at 1588-0608 (fees apply) in South Korea or at 82-2-2190-0901 (free with KT mobile phones) from overseas. KT SIMs can be purchased at the KT’s Roaming Center – located at the Incheon, Gimpo and Gimhae airports and Busan Port – by providing a valid passport or an Alien Registration Card as an official form of identification, and a credit card matching the applicant’s name with an expiration date extending more than 3 months from the purchase date. KT offers two different temporary SIMs for travelers: Prepaid Data SIMs and Prepaid SIMs. KT’s Prepaid Data SIMs offer unlimited data usage and free inbound calls and texts, while Prepaid SIMs also allow outbound calls and texts at affordable rates. Mobile users who plan to stay in South Korea for a long time, or are traveling in a group, should consider the KT WiFi Router. The wireless router allows multiple users to simultaneously access unlimited data. The router can generally handle up to three connections at one time without connection troubles. Foreign visitors can use KT SIMs on their smartphones immediately after checking their handset’s compatibility at the KT Roaming Center. Third parties cannot collect KT SIMs and payments can be made with credit cards or in Korean won. KT SIMs can be returned to any Roaming Center and a third party may do returns. The service can only be used on smartphones with WCDMA capabilities, and certain functions such as video calls may only be available depending on the model of the handset. KT SIM customers can also enjoy big duty free benefits, such as a free VIP Silver Card that offers up to 10 percent discounts at Lotte Duty Free Shops, a 10,000 won prepaid cash card and $10 worth of online Lotte Duty Freecredits. Taking part in the discount is simple. After collecting the KT SIM, visit the Lotte Duty Free Shop along with a passport and the KT SIM package to receive the benefits.